This article explains how to setup / schedule cron emails for Email Subscribers in Parallels Plesk. Step 1 : Login to your Parallels Plesk. If you don’t have login information, please contact your hosting and get one for you. Step 2 : Go to the Domains or Websites & Domains section. 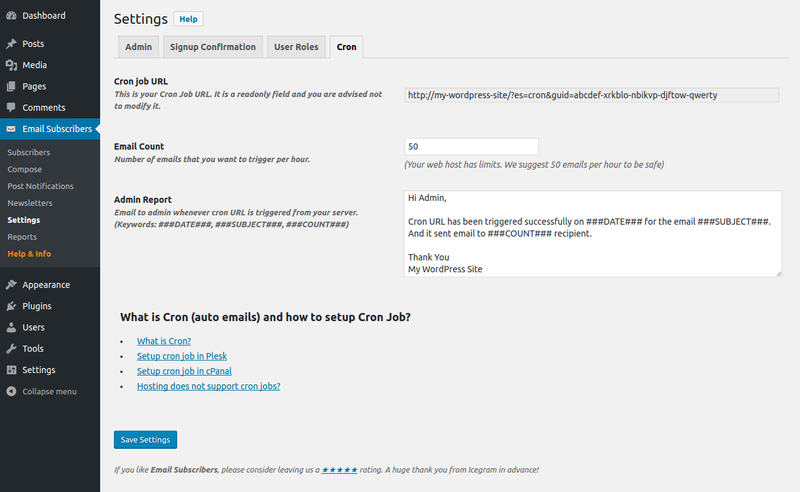 Step 3 : Now select the domain where you want to add the cron job. Step 4 : Click on Scheduled Tasks under Additional Tools. Step 5 : Select the System user under whom you want to run the scheduled task. Step 6 : Click Schedule New Task. Step 7 : Specify the time when you want to run some specific command. Day of the Week — enter the value from 0 to 6 (0 for Sunday), or select the day of the week from a drop-down box. You can schedule the time using the crontab entry format. Enter several values separated by commas. Two numbers separated by a hyphen mean an inclusive range. For example, to run a task on the 4th, 5th, 6th, and 20th of a month, type 4-6,20. Insert an asterisk to specify all values allowed for this field. For example, to run a task daily, type * in the Day of the Month text box. Step 8 : Finally enter your CRON URL in the Command text box. Please find the syntax below. Click on OK once you have entered the command. Step 9 : Success! The new cron task has been successfully set up.